Artists are creatures of habit and their methodology and fastidious nature can be likened to other creatures in nature. The Progeny Project was conceived by sound artist, Luke Aaron Clark and visual artist, Bryce Hammond. “Progeny” is defined as “a descendant or the descendants of a person, animal, or plant; offspring.” The immersive architectural sound installation measuring 24 x 24 x 9 ft is modeled after the interior of a Langstroth beehive thus realizing an artist colony. There are ten partitions covered in acoustic paneling with 48 microphones and 36 speakers that transmit every single sound originated in the space. Beekeepers engage in a systematic migratory procession carrying up to 400 hives on flatbed trucks in search of seasonal pollen. 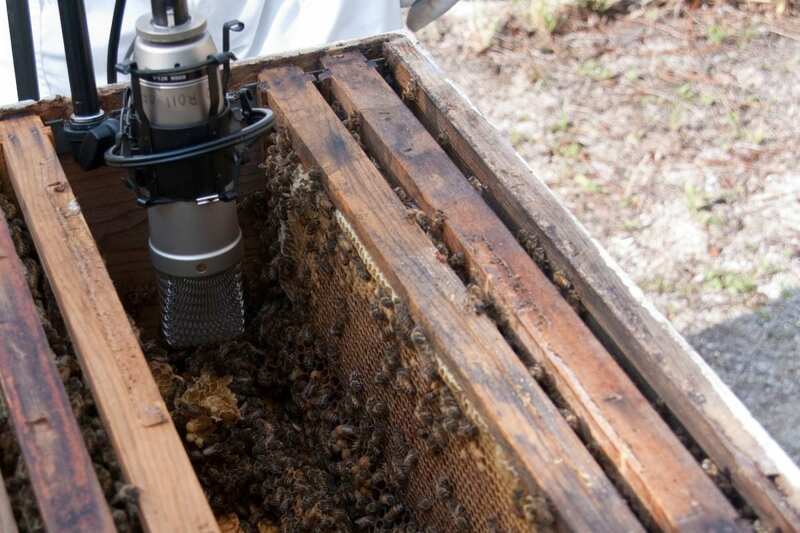 Inside each Langstroth Hive lives a colony of 20,000 – 80,000 European honeybees. When the colonies are placed by the beekeeper in the new ecosystem, the bees begin their procession with the unified goal of feeding and caring for the next generation of their colony. How does a community of bees survive this migratory process? How do these colonies adapt to new and temporary ecosystems? How do they function within the limits of a man-made architectural object? Bees live in extraordinarily complex and cohesive societies. They coordinate virtually all of their activities with other individuals to ensure colony survival. Much can be learned and transferred from bee society to human society, including maintaining public health; organizing efficient information, communication, economic and transport systems while maintaining harmony. Each bee has a specific role in constructing a healthy society – as does each human. Should any segment of the societal body suffer, the whole body suffers. Progeny is a human project exploring a microcosm of human community through interaction inside an architectural space similar to a beehive. The artists have figuratively become beekeepers. The hive-based installation is man-made. 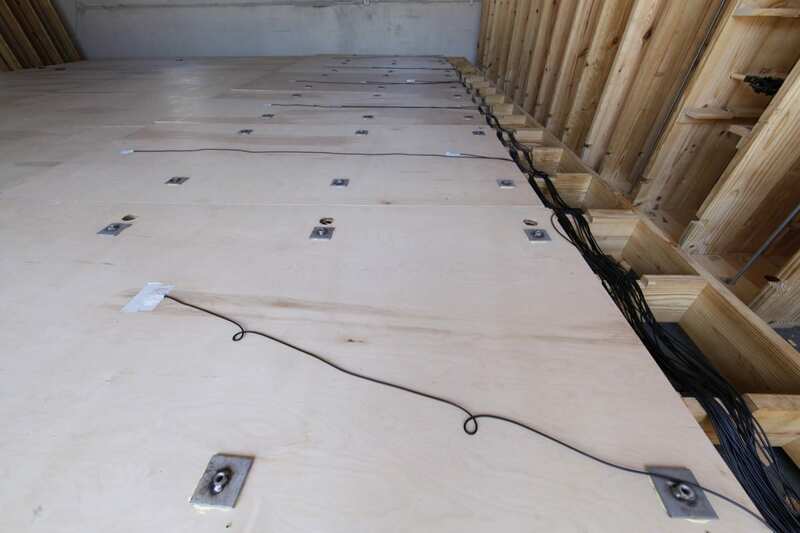 The structure is disassembled, transported on a flatbed truck to another temporary location where it is reassembled. With each exhibition an opportunity is provided for a new community to evolve, learn, adapt and interact. The Progeny Project began at Atlantic Center for the Arts (ACA) in Florida, US where sound artist Luke Aaron Clark and visual artist Bryce Hammond attended a multi-disciplinary artist residency in June of 2010. It was at ACA that the two artists began collaborating on a small-scale interdisciplinary project involving paintings injected with sound recordings. During residency, both artists were introduced to honeybees by Doug McGinnis, an ACA board member and co-owner of Tropical Blossom Honey, who keeps Langstroth beehives at ACA for honey production and fundraising. 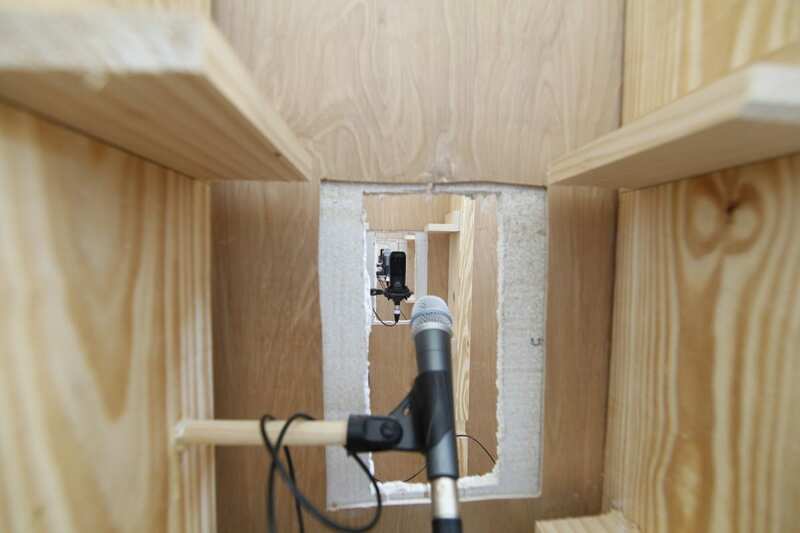 Whilst in residence, Clark recorded the sounds of the bees’ interactions by installing microphones into the ACA hives. These recorded communications within the colony instigated Clark and Hammond’s early discussions on bee society. Clark recording honeybees in one of the ACA hives. Photo by Chris Reynolds. After the residency, Clark returned to his sound studio in France and Hammond to his painting studio in Florida. Though Skype meetings the artists started to talk about creating a large-scale architectural sound installation based on their experiences with the beehives. They planned further research into the agricultural and societal implications of bees and their role to food production. These meetings led to a research plan that would explore the society of beekeepers, pollination and beehive migration. In 2011 Clark and Hammond conducted a documentary research trip to Nevada and California. The trip began at the North American Beekeeper Association Annual Conference in Las Vegas where the artists shot extensive video interviews with the most influential beekeepers and bee experts in the United States. During their trip the information divulged about the pollination of the California almond fields directly affected their research. Almond trees cannot cross-pollinate without the help of honeybees. During the almond blooms of mid to late February, beekeepers move thousands of hives on flatbed trucks to the almond groves of California’s Central and San Joaquin valleys. After leaving Las Vegas, Clark and Hammond drove to Visalia, California to photograph and video the Central Valley’s expansive almond groves. This was followed by a trip, to Westmoreland, California, near the border with Mexico, to see first-hand how these bee colonies were managed. 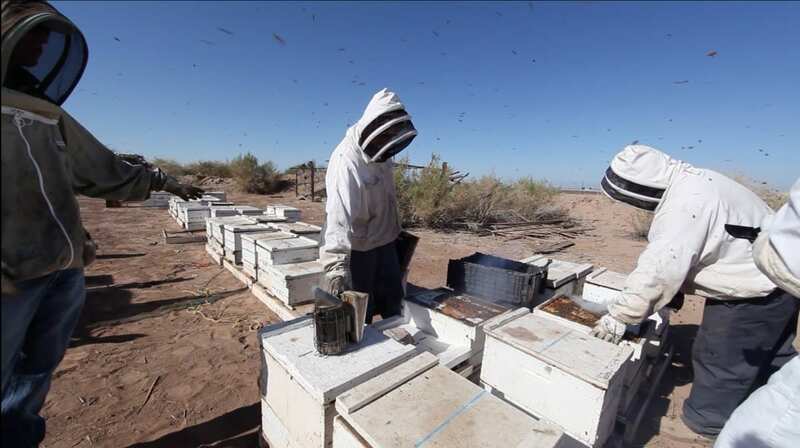 The artists were invited to work with beekeepers to provide food and supplements to the bees in preparation for the pollination season and the relocation of their hives using large flatbed trucks. 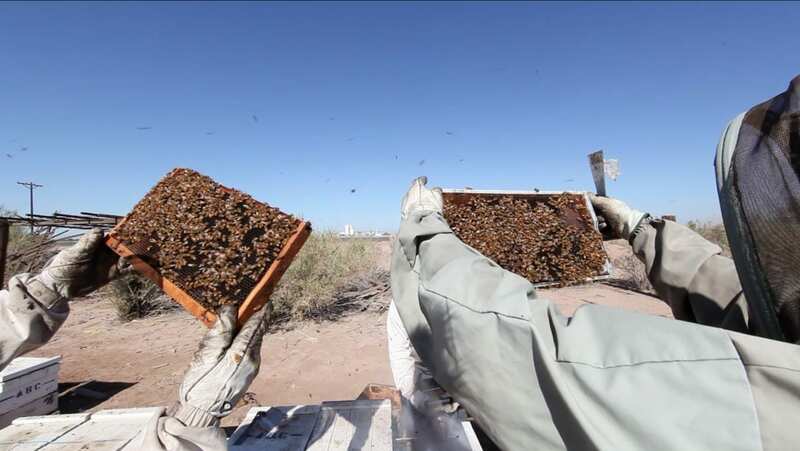 Each colony is created of about 60 – 90,000 honeybees and on each truck there can be up to 400 hundred hives. At full capacity, this equates to transporting over 35 million bees, equivalent to the most populated state in North America, California, or the whole population of Canada. An entire community of bees have to work together to survive and adapt to a new ecosystem. This mass migration introduced interesting comparisons with how humans migrate and adapt to new environments. Dressed in bee suits, the artists opened hundreds of hives, looking through the frames and space inhabited by the bees. It was there that they decided that Progeny should be a human project on a human scale based on the construction of the Langstroth beehive. This would require the human hive to be 16 times the size of a beehive, made up of nine chambers, portable and uniform using standardized building techniques and materials. 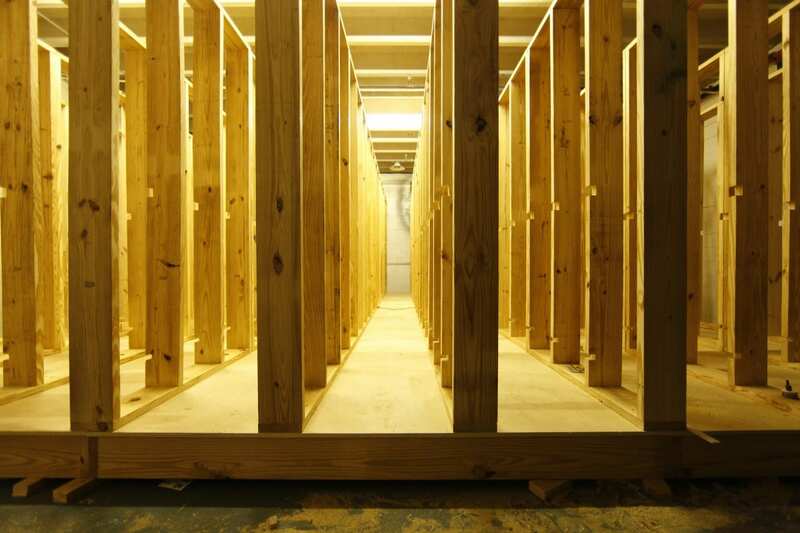 The installation is designed whereby every unit is constructed using 4’ x 8’ frames, including walls and flooring. Acoustic tiling, commonly used in human-interactive workspaces, envelops the wall surfaces. In addition to their sound depleting properties the white tiles are symbolic of our everyday work environment. Ten independent walls create nine narrow corridors 24 ft in length. The narrow width of each corridor compels close public interaction. The space above the walls is designed without a joining ceiling. This creates enhanced balance, perspective and visual rhythm. The open-air design allows values and tones to alter with time passes and light varies. The Langstroth hive as an architectural man-made object is a profound example of how acoustic environments can fuel and trigger group behavior. For honeybees it plays an important role in their survival. The queen bee signals to the honeybees to contract their wings, this creates the sound of buzzing associated with a honeybee. Through a unified act, a combined contraction of wings, the honey bees’ warmth and oxygenate the hive and signal when the hive is under threat. The structure they built and live in, helps to reverberate and transmit this collective sound. The installation’s sound design is the result of continued research on how sound interacts with different materials, and how everyday environments, particularly man-made environments, have their own acoustic characteristics based on the surrounding materials (i.e. wood, metal.) Research extended to the idea that the sonic landscape we inhabit influences our behavior, our interaction with the environment and the people living in it. It became increasingly important to investigate the physicality of sound, to think about how sound can be a trigger for behavior, and to explore how sound morphs into a new being, according to how we interact, singularly or unified, within our own architectural acoustic environments. These considerations began to inform decisions the artists made regarding structural attributes and the materials used. 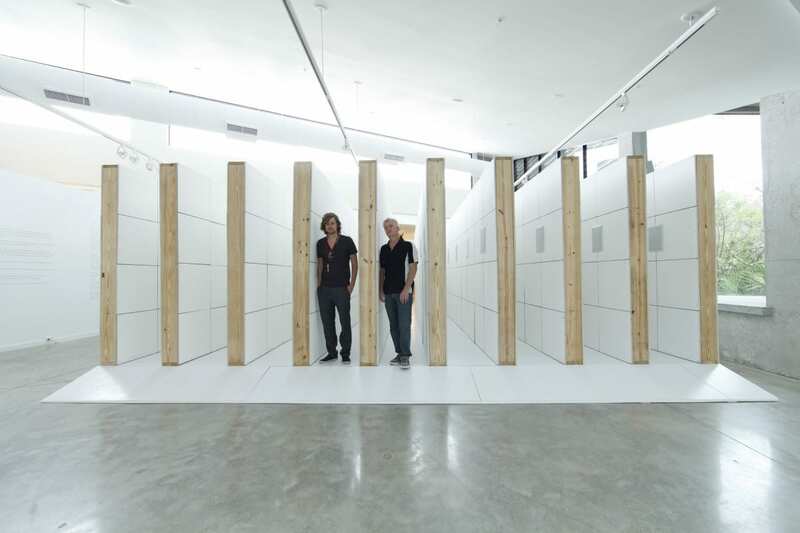 Clark and Hammond began to create a piece of architecture, where the sound of the materials themselves, become more present. By walking across the wooden surface of the flooring, or brushing past the fibre of the ceiling tiles, you can hear the acoustic qualities of the materials you are interacting with. The narrow confines of each corridor, and numerous microphones embedded in the walls and flooring, help to augment this effect. The artists also aimed to enhance the ambient and unified sound of people interacting within the space. This was achieved, by installing 32 contact microphones under the flooring of the structure, which pick up the vibrations of people’s footsteps. These, alongside the microphones within the walls, transmit sound to 36 speakers throughout the installation. Transmitting enhanced natural sound sources throughout the installation brings a heightened and acute awareness to those interacting within each chamber that their own presence can be felt elsewhere. Each person entering the environment forms part of a collective sonic-landscape. 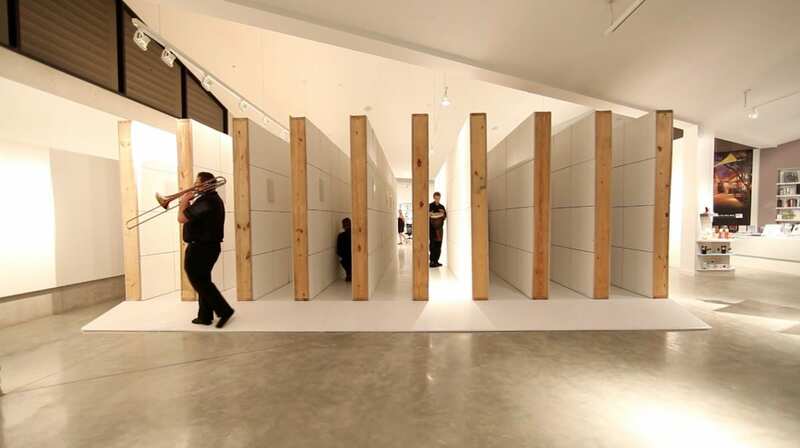 The visual barriers each of the corridors provide only serve to intensify the experience. Clark and Hammond produced a documentary about the project, and a program of education and events, to make their work accessible to the wider community and to encourage participants to explore the themes of community and the environment. It was not the artist’s intention for Progeny to become environmental activism; nonetheless, they could not ignore the attention that honey bees have drawn in recent years. Studies have shown that one in three mouthfuls of food we eat is pollinated by honeybees. There have been growing concerns that bees are disappearing, and for a variety of reasons, including, over-farming, monoculture, pollution, Africanized bees, pesticides, the Varroa mite (the list goes on.) A positive by-product of Clark and Hammond’s project is increased awareness of the crucial and interdependent relationship we share with bees. Their project also explores the concept of applying what we can learn from nature to our own lives and the communities that we interact with. In their own exploration of human interactivity, the artists’ are keen to document how different cultures interact and adapt to the Progeny sound installation. Clark and Hammond are continually and actively seeking new international audiences. 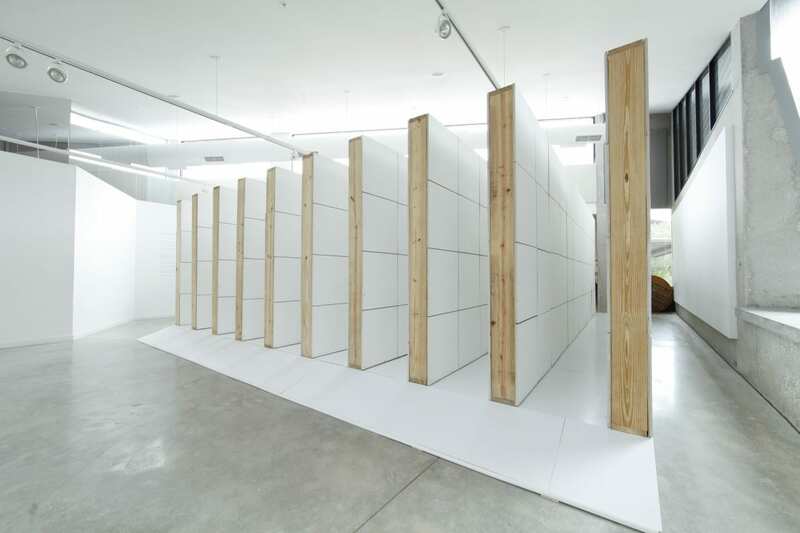 Much like Langstroth beehives, the installation will be transported to new venues, including Atlanta, New York, Paris, Berlin, and London, where an opportunity is presented for a new community to interact and adapt to a new environment. 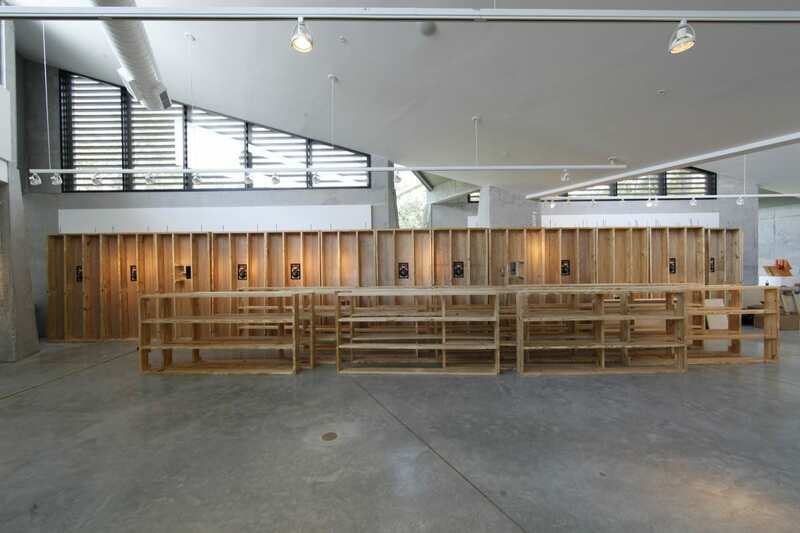  Archived in Uncategorized and tagged Architecture, Atlantic Center for the Arts, Bees, bryce hammond, Design, Hives, Install, Issue 36, luke aaron clark, North American Beekeeper Association, progeny, Sound. Bookmark the permalink.